First up is Paul Breines (above), who now teaches history at Boston College. Then a sophomore at the University of Wisconsin, he was arrested at the Greyhound station in Jackson on July 21. 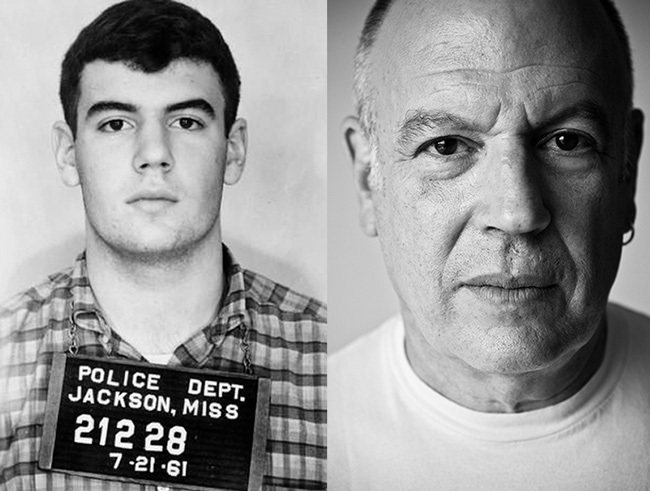 Along with many other Freedom Riders, he was incarcerated in Parchman Prison in the Mississippi Delta on August 4, the day President-elect Barack Obama was born. I’m sure that other Freedom Riders have had the same experience I have had, namely, of having people, both black and white, say things to the effect that I must feel good and proud to realize that we helped to make the Obama candidacy possible. I’m also sure that, if I hadn’t taken part in the rides, I would now be saying the same thing to people who had. A kid in the class I visited asked me if I was proud of what I did. I said that I’m so glad that I did what I did and would do it again, but that like probably all of the white Riders, I was and remain in awe of the black people who did it. The kid who asked the question said, “Well, we’re proud of you.” And another one said, “Yeah, you were helpin’ us out.” I couldn’t speak. I just got tears in my eyes, so maybe they convinced me. I thought that if the Freedom Rides helped to make this possible, then, Jesus Christ, I don’t know what to say. I wished that Schwerner, Chaney and Goodman, and the four girls blown up in Birmingham were alive to see this. I thought of my childhood passion for Joe Louis and Jackie Robinson, and kept sobbing, like Jesse Jackson and so many others all over the country and the world, in relief and joy, and a sense of the vulnerability of it all. Thank you for being one of the heroes that has made Obama’s presidency possible. thank you. for then and for now. and we shall continue to overcome. I cried when I read your reflection of history and the anecdotes from your recent classroom experience. Thank you for sharing your story for it needs to be heard. I went to canvass for Obama in Jackson, MS with a bunch of law students and the experience still resonates with me. But we truly wouldn’t have this moment in history if not for your courageous actions at that fateful time. Thank you for your courageous example to us all. Paul: My wife and I met you in New York at the Breach of Peace party and were impressed by your humility, courage, and intellect. Your post on this website is very much in keeping with the person we encountered. It is an honor to have met you. In the wake of Obama’s extraordinary electoral victory, renewing our democracy and our hopes, I want to thank you and all the freedom riders once again for the service you all performed. Your actions have helped usher in a better world. You put yourselves at risk, not only on behalf of the unjustly disenfranchised, but also on behalf of the indifferent and the hateful. The children and grandchildren of those who screamed at you inherit a better world (and a better spirit) today because of the courage of all civil rights workers. This made me weep with joy. May you be remembered always for what you did. There are no braver Americans than those who would stand up for those who don’t enjoy the freedoms and liberties that we so often take for granted. I was also angry at the defeat of Prop. 8 in CA. And kept crying especially when the camera panned on Jesse Jackson. The courage and persistence of so many have created the road. I hope courage and persistence is awakened in the many more needed to widen the path, and open new ones. I am doing a research video on the civil rights movement as a project for an education class. As a historian I am so proud of what you did. As an Army Brat who never knew there was a difference in skin color I wept reading your statement. As a now southerner, who lives outside of Birmingham, I stand up and applaud you. You and the other riders are true heroes. Just like our soldiers and the firemen from 9/11. Again THANK YOU!!! !